July 4th 1968 Hobie Alter, R. Paul Allen, Sandy Banks and a group of surfers all meet at Wayne Schafer’s home. A rail line ran behind Wayne’s house with a large sign that read “POCHE.” Therefore, Wayne’s place became known as “Poche Beach.” Little did they know they were making history on this day. Six Hobie® 14’s went out and raced. It was the first Hobie sailing regatta. There were only six boats racing as there were only six Hobie 14’s built at that stage. They often raced each other for fun during that developing stage of the Hobie 14. Mostly though, the great fun was surfing the Hobie 14 in the waves off Poche Beach. On windy days thereafter, they would meet at “Poche Beach” rig their Hobie and sail offshore. Surfing waves, flying hulls returning to the beach caught the eyes of other surfers as well as others and the rest is history. It all started with the Hobie 14. The photo of Hobie Alter sailing his Hobie 14 has been seen many times. The iconic photo R. Paul Allen took with his waterproof Nikonos camera back in 1969 at Poche beach. R. Paul Allen had instructed Hobie to sail directly at him as he sailed over the waves at Poche on that windy day. Several close calls later he finally got this shot of Hobie flying over the wave barely missing him with his rudder. It was well worth it, as R. Paul Allen sent the photos to Life Magazine. 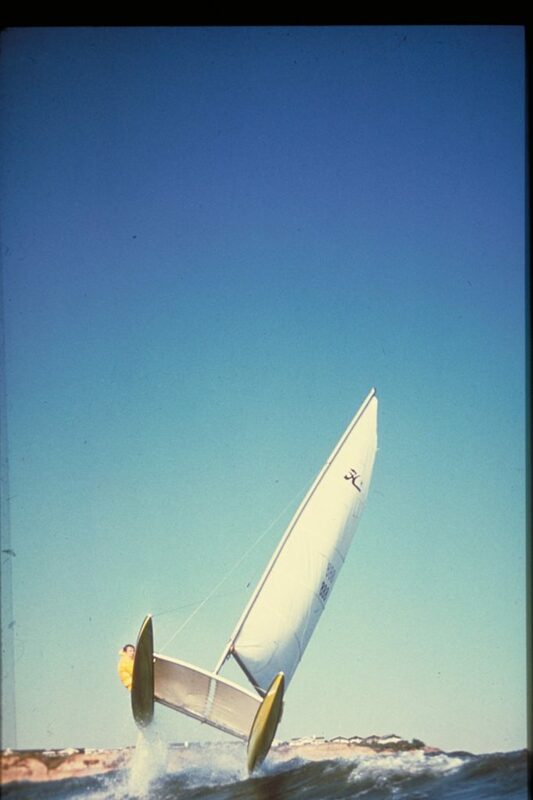 They were impressed and sent a Life photographer to take additional photos, and in February 1970 they featured the Hobie 14 with the headline “The Cat That Flies”. Considering the important status of Life Magazine at the time, that featured story opened the door to more stories by other important magazines and newspapers thanks to Paul’s photo and promotion of the Hobie 14. 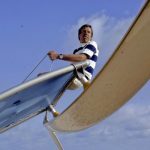 R Paul, who had done the promotion, marketing, and presentations of the iconic movie The Endless Summer in 1966 and was also a skilled catamaran sailor and racer, was contracted by Hobie in 1969 to help promote, market and set up the racing program for his Hobie 14. Paul wrote the original sailing manual and also directed and narrated the first Hobie 14 movie filmed exclusively at Poche Beach. The film was a huge hit at all the boat shows when the unique Hobie 14 was premiered in 1969. That small group of sailors/surfers on July 4th1968 at Poche Beach created history. 50 years later the Hobie 14 is still actively raced around the world. The Hobie 14 went on to sell around 60,000 boats worldwide. Today we look back an honour and thank those men for their vision. They created history that had probably never been achieved or will be achieved in sailing again. Who won that first regatta? Sandy Banks, one of the initially designers of the Hobie 14 with Hobie Alter.